Recycling Works: Is Styrofoam Recyclable? The recycle symbol on polystyrene also lets consumers know what type of plastics and other materials are used in its production. The components of utmost concern with #6 plastic are phthalates and Styrene. Phthalates, called “plasticizers,” are a group of industrial chemicals used to make plastics like polyvinyl chloride (PVC) more flexible or resilient. It is found in, among other things, toys, food packaging, hoses, raincoats, shower curtains, vinyl flooring, wall coverings, lubricants, adhesives, detergents, nail polish, hair spray and shampoo. Styrene, the basic building block of polystyrene, is used extensively in the manufacture of plastics, rubber, and resins. About 90,000 workers, including those who make boats, tubs and showers, are potentially exposed to styrene. Health effects are generally irritation of the skin, eyes, and upper respiratory tract, and gastrointestinal effects. Chronic exposure affects the central nervous system showing symptoms such as depression, headache, fatigue, and weakness, and can cause minor effects on kidney function and blood. Styrene is classified as a possible human carcinogen by the EPA and by the International Agency for Research on Cancer (IARC). With our current recycling systems and processes, polystyrene is still considered a trash item. 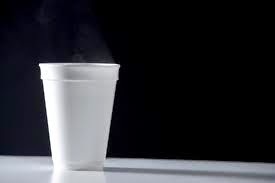 Considering the chemicals used in its production, the possibility of it leeching into the food or drinks stored in it, and the extreme length of time it stays in our landfills, hopefully more alternatives will be used in the future and polystyrene will be a thing of the past. For more information on acceptable items for recycling visit www.wasteawaygroup.com.